This Thesis presents a proposal for building an effective, legitimate, and transparent judicial system in the investor-state dispute settlement through an appellate review mechanism for the awards of ad hoc arbitral tribunals. Current investment dispute settlement system includes the arbitration facilities provided by institutions such as ICSID and ad hoc arbitration tribunals agreed by the disputing parties. This Thesis argues that this scheme of investment arbitration lacks the mechanisms for correcting the legal errors and securing the consistency between arbitral awards for the similar issues of investment law. 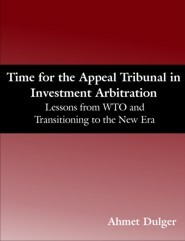 As a comparable mechanism, the WTO Dispute Settlement Mechanism is examined to contribute to the establishment of a viable appellate mechanism in the investment arbitration. The WTO Appellate Body is the leading example for a multilateral dispute settlement mechanism. Therefore, lessons from the WTO experience and structure of the WTO Appellate Body are examined to create a transparent appellate mechanism for investment arbitration. Opposed to the EU TTIP Proposal on the establishment of a tribunal of first instance, the investment law must keep its ad hoc arbitration system in order to respond the unique needs of each dispute. With the aim of improving the dispute settlement system, the Appeal Tribunal, a standing body charged with deciding appeals of law, is at the center of the proposal. By preserving the flexibility of ad hoc tribunals, the Appeal Tribunal would be likely to achieve the goal of harmonizing international investment law. Ahmet Dulger graduated from Istanbul Sehir University School of Law as the top scoring student of Law School. He completed his LL.M. degree at New York University (NYU) School of Law (2017). He attended Law School programs at London School of Economics (LSE) and European University Viadrina. Ahmet DULGER focused his studies on International Arbitration, International Investment Law, and International Commercial Law. He works as a lawyer in Turkey. His areas of work include Commercial Law, International Commercial and Investment Arbitration, and Employment Law. Ahmet Dulger is a licensed attorney at law in Turkey. He is a member of Istanbul Bar Association. He is now in the admission process to the New York State Bar Association to be a fully qualified lawyer in the United States of America.